Barista Laura Baugh whips up the perfect pumpkin spice latte at Holtfield Coffee Station on Tuesday. When pumpkin spice lattes are back on the menu, it’s a sure bet fall can’t be far behind. The Tuesday launch of the perennial fall favorite by Starbucks is the flavor’s earliest official debut, but Highland County coffee aficionados don’t have to drive all the way to the Mt. Orab Starbucks to satisfy their pumpkin spice craving. Deborah Sweazy, the manager of Speedway at the corner of West Main and Elm streets in Hillsboro, told The Times-Gazette that Wednesday will be the big day at her location. 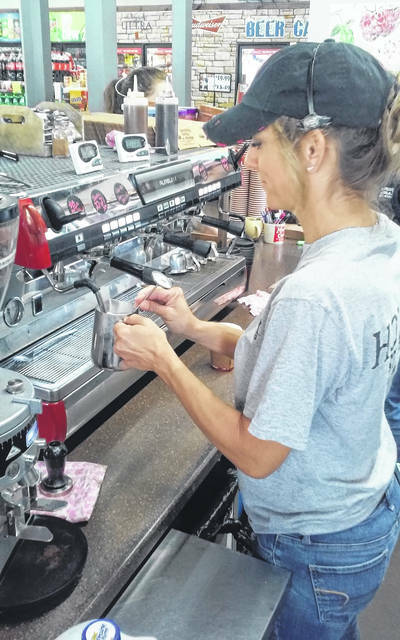 At Holtfield Coffee Station on South High Street, manager Robin Randle said her customers don’t have to wait until the leaves change to enjoy their favorite fall latte. The Lynchburg native has been Holtfield’s coffee shop manager for the past five years and said the pumpkin spice flavor puts people in the mood for fall. According to Randle, when snow flurries are in the air and holiday shows return to TV, local tastes gravitate toward peppermint mocha flavors. https://www.timesgazette.com/wp-content/uploads/sites/33/2018/08/web1_Laura-Baugh-photo-1.jpgBarista Laura Baugh whips up the perfect pumpkin spice latte at Holtfield Coffee Station on Tuesday.